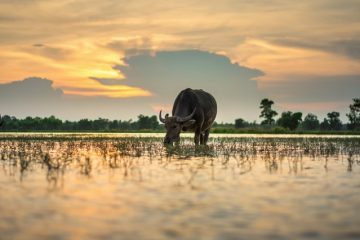 The continuing efforts of the Philippine Carabao Center (PCC) to encourage Filipino farmers to venture into carabao-raising and carabao-based enterprises has given rise to a new kind of partnership with private entrepreneurs who have the capacity and willingness to help pursue the goals of the agency. These partnerships are manifested in the Dairy Buffalo Multiplier Farm (DBMF) project, which, from indications, is now well on its way to expansion. In the town of Javier, Leyte, 73 kilometers south of Tacloban City, one can find the country’s first DBMF, which was established by proponent-cooperator Michael Javier on a fourhectare plot of land in Sitio Mapula, Zone II after entering into a DBMF agreement with the PCC. Dr. Arnel N. Del Barrio, PCC acting executive director, together with the staff of PCC at Visayas State University (PCC-VSU) in Baybay, Leyte, officially turned over 50 Italian Murrah heifers in a ceremony held in late 2014, marking the official launch of the country’s first DBMF project. Del Barrio explained that the multiplier farm is another strategy aimed at increasing the population of dairy buffalos and its breeder base, improve animal productivity in order to help ensure the availability of milk, and serve as a demonstration farm for farmer-partners and stakeholders for better appreciation of buffalo-based enterprises through dairying. He added that the Department of Agriculture supports the implementation of the DBMF operation scheme as it believes that this project can contribute substantially to the sustainable growth of the Philippine dairy industry and create more livelihood opportunities. Operating a DBMF basically involves breeding, milk production and processing, and establishing a sustainable dairy enterprise. 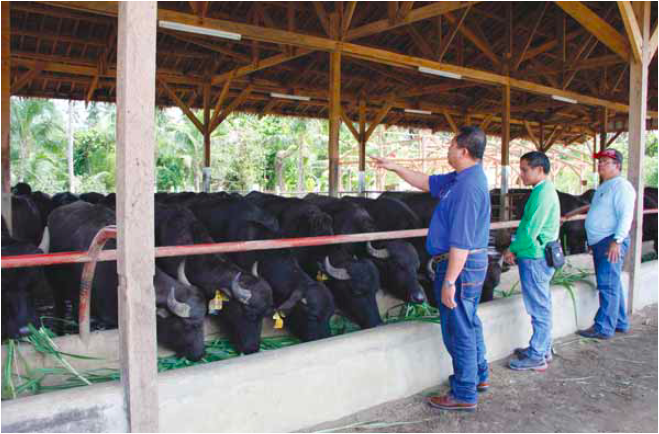 The covering contract is awarded to qualified farmer-trustees, and this gives them access to good quality animals and technical support for carabao production, breeding, and marketing activities. Under the applicable scheme, the PCC entrusts a number of imported or island-born purebred heifer animals to the DBMF partner, depending on his or her capability to care for these. The animals are to be paid for within an eight-year period. The first payment, in the form of heifers, commences within or at the end of the fourth year of the contract, and the last payment is within or at the end of the eighth year of the contract. The heifer should be at least 14 months of age, weighing not less than 220 kilograms, and possessing the average body size for its age. A fourth-class municipality with 28 barangays, most of the households in Javier town are engaged in corn, abaca, and coconut planting. Mayor Leonardo Javier Jr. said that the DBMF project in his town will translate into economic benefits for his constituents. What does this multiplier farm mean to the town? “It means we will have milk, so we will have [a source of] income. We will have organic fertilizers from the animal manure. We will benefit a lot,” he said in his message during the turnover ceremony. Dr. Julius Abela (in the dark blue polo shirt), Philippine Carabao Center director at Visayas State University (PCC-VSU) in Baybay City, Leyte, inspects the herd of Italian murrah heifers entrusted to the proponent-cooperator of the country’s first Dairy Buffalo Multiplier Farm (DBMF), which is based in Javier, Leyte. It was not smooth sailing at the start. The Javier DBMF personnel had to work double time to set up the required housing facilities for the animals. For two weeks, the construction work for the facilities were in full swing. Intensive hands-on training sessions were also held so that the personnel could familiarize themselves with the actual management of the dairy animals. According to Dario Divino, Javier DBMF supervisor, the challenge they confronted was how to keep the animals healthy and disease-free. “We monitored the animals 24 hours a day. We divided [our 12 staff members] into two groups: [the] day shift is in charge of feeding and health monitoring of the animals while the night shift conducts heat detection,” said Divino. On the part of PCC at VSU, its center director, Dr. Julius Abela, insists upon close health monitoring and that technical assistance to the farm is always at hand. The center’s staff also assisted in the planting and growing of napier grass in the forage areas. The farm uses artificial insemination for breeding management. Out of the 30 animals artificially inseminated, a dam gave birth to a female calf in August 2015. Additional births are expected in the future. The farm also practices the use of coco peat as animal bedding; it also helps lessen foul smells on the dairy farm while helping keep the pens clean and dry. The coco peat primarily consists of coir fiber pith or coir dust, which is obtained by processing coconut husk and removing the long fibers. It can hold large quantities of water, just like a sponge. “Twice a day, after cleaning the area, we scatter the coco peats on the pens,” Divino said. “The animal wastes that we collect every day are transformed into organic fertilizer, which we apply to our forage area,” he added. According to Divino, the DBMF management is undertaking the necessary preparations for the construction of the farm’s milking parlor and processing plant to prepare for the much-anticipated future milking activities of the farm. The Javier DBMF management will also adopt the PCC “paiwi system” for animal re-dispersal in the community. “The farm’s role is to multiply the animal stocks and eventually distribute the calves produced to qualified farmers in our areas as shared animals. We will help the farmers… become our business partners. 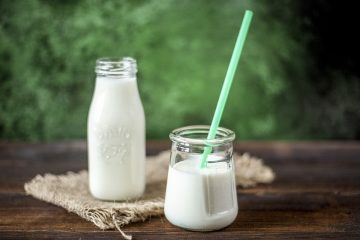 Milk collected from the animals that we entrusted to them will be collected or delivered to us,” Divino said. The farm, which aims to raise its herd up to 100 head over the next few years, intends to market the processed products through the popular Andok’s chain of stores, a family business owned by the Javiers. Two other DBMF proponent-operators have been added to the list of qualified beneficiaries of the program. 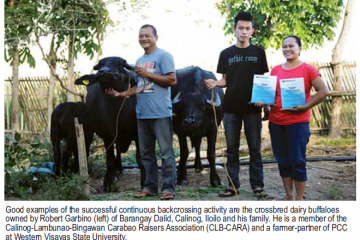 Both in Tarlac, the new DBFMs are operated by Alfredo Belen Farm and RG Agustin Dairy Farm. Alfredo Belen, owner of the Belen Farm in Magao, Concepcion, Tarlac, was entrusted with 40 head of Italian Murrah heifers in December 2014. 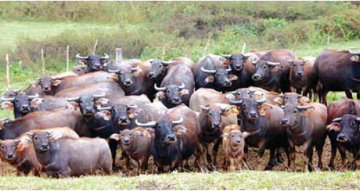 To date, 11 calves have been produced and six of the breedable buffaloes were confirmed to be pregnant. The turnover of the multiplier dairy module to RG Agustin Multiplier Farm in Tambugan, Camiling, Tarlac was done during the inauguration of the PCC’s Livestock Innovations and Biotechnology (LIB) complex in March 2015. The 25-head Italian Murrah heifers were awarded to Rommel Agustin, owner of RG Agustin Dairy Farm. As of September 2015, one female calf had been produced. In the days ahead, with the three DBFMs serving as forerunners, PCC hopes to see more dairy buffalo multiplier farms in other parts of the country. This appeared in Agriculture Monthly’s February 2016 issue.